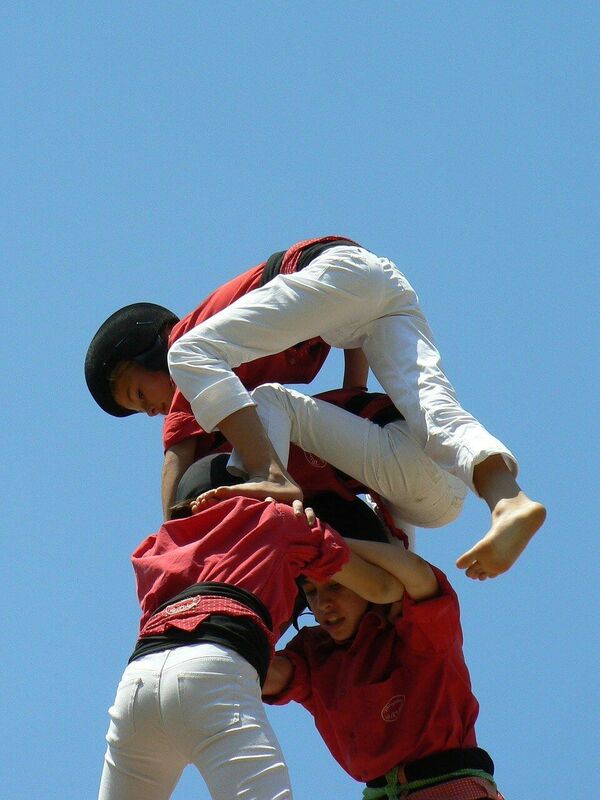 One of the most original and local experience you can live while visiting Barcelona is to be part of a Castells exhibition. Castell means castle and this is a local tradition which is becoming very popular thanks to a report filmed by the BBC and a recent video filmed by RedBull. Nowadays this tradition is living a golden age. As a result, there are 71 colles (groups) based in the region and 9 groups abroad. That makes plenty of castles or towers built every year! If you plan to go to a rehearsal or an exhibition, you should be familiar with some words. Castells: means castle. This is the main towers the groups built. To describe a castle we use two numbers, the number of people per level and the number of levels. A 3 of 9 means: 9 levels with 3 people on each one. They built pillars as well. They just announce the levels because since there is a pillar, there is just one people per level. Pinya: means bulk, in reference to the people supporting the castle on the grounds. To build castles of 9 or 10 levels they need several hundreds of people. Whenever a Colla wants to build a high castle, the members of the other groups will help being the bulk which works and a foundation to support the building. Enxeneta: this is like the rider. The topmost casteller. Is has to be light, so this is a child. To watch them perform is impressive. It will make you speechless. But do not panic, they were a helmet. Just in case. 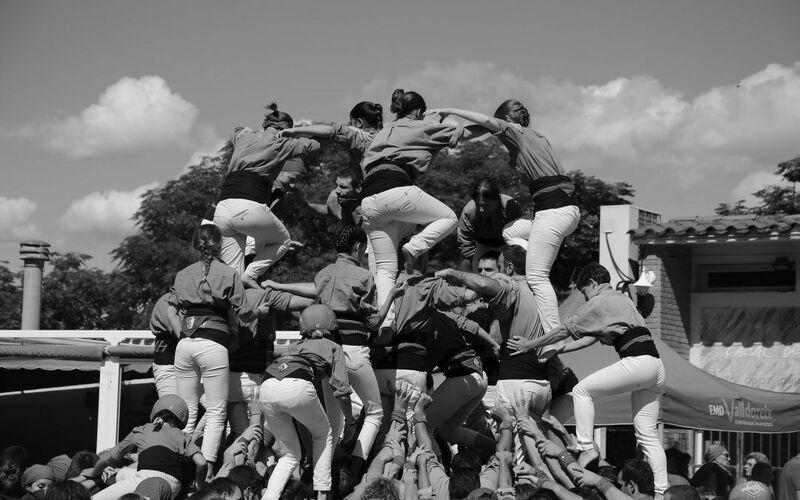 As far as we know, this tradition started in the south of Catalonia, in Valls. 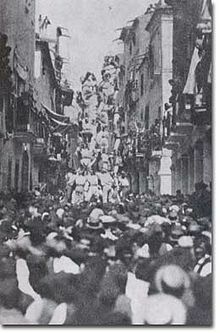 To go along with some religious processions, people used to build some human pillars. At the end of the 18th century this pillars became more important and and bigger and they became a tradition by themselves. 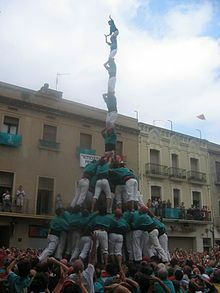 At the same time, the tradition spread all along the Catalan region and by the end of the 19th century some groups where able to build castles of 8 or 9 floors. From 1889 to 1926 this tradition almost disappeared. The main towns where this tradition is stronger are connected to the wine industry, and with the arrival of the phylloxera pleny and the following crisis plenty of people had to move to Barcelona or Tarragona. The only town which has never stopped this tradition is Vilafranca del Penedés. This is the reason why, today, Valls (where the castles were born) and Vilafranca have the oldest colles (groups). Since 1926, things have gone better and better and the castles have gone higher. 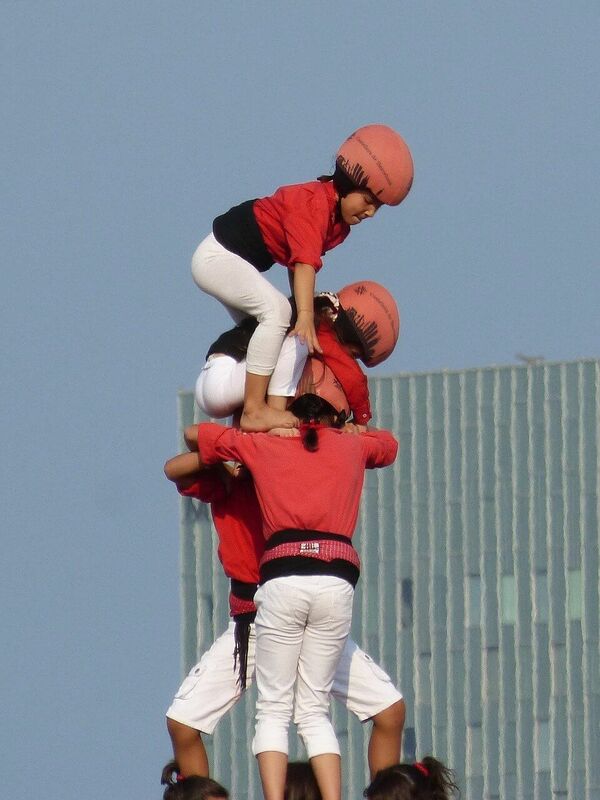 If you ever go to an exhibition (there are exhibitions, never contests) probably you will be a part of a construction of ten floors, it means a human tower of about 12 meters. In additon, the Colles have an important social role. If you ever go to an exhibition or a rehearsal you will notice that there is people of several nationalities. Belonging to this collas help this people to assimilate, to become a part of the local society. It helps to integrate people recently arrived.